This technology offers the same features as with Dual Function QR codes but with greater functionality. The target is not to engage consumers but instead facilitate data collection and validation by an authorized codeREADr app-user. 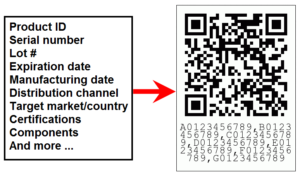 The QR code (or other 2D codes like Data Matrix or PDF-417) or the NFC tag would have multiple IDs (or URLs) embedded it. Depending on the task assigned to the app-user (each a ‘Service’), one of more of those IDs would be parsed from the string of IDs embedded in the barcode. The parsed IDs would be checked against a table of valid IDs in the ‘validation database either hosted on codeREADr’s servers (or yours) or downloaded to the app. If the ID is in the database, the app user will see a Valid response; if not, the response will be Invalid. So, for example, let’s say there was a recall on a product or asset. When the app-user scans the barcode, the app would parse out the product ID and serial number (or just the serial number) and then validate that against a table of recalled serial numbers. If valid, that product is recalled. Another example would be tracking grey-market goods. The app would parse out the product ID and channel ID (or just the channel ID) to validate against a table of what’s expected in that channel. If Invalid, that product is not in its intended channel. Can this also be accomplished with multiple barcodes instead of one QR code? Yes it can, but if more than one ID is needed to facilitate validation then the multi-function barcode is faster; less prone to scanning mistakes; it saves space on the product while lowering label costs. You will use the codeREADr feature ‘Alter Scan Value’ described here. The barcode should be embedded in the QR code with a comma separating each ID (no spaces). For the pattern, create a string use one of these patterns ^([\s\S]*?) for each unique ID, each separated with a comma. The replacement value would be $X where ‘X” is the location of the ID you want to parse. To parse more than one ID just separate each replacement value with a comma.